This chili hand pie recipe has been a long time coming. Like, maybe a year or more. The gears started turning on this when a friend received a delivery of whole-wheat empanadas from his mother. She’d heard he was “eating healthy” and that meant whole wheat instead of white flour, right? At the time we both saw the humor in it (I don’t remember if he bit the gluten bullet and ate them or not) but I began to wonder what it would take to make grain-free empanadas. 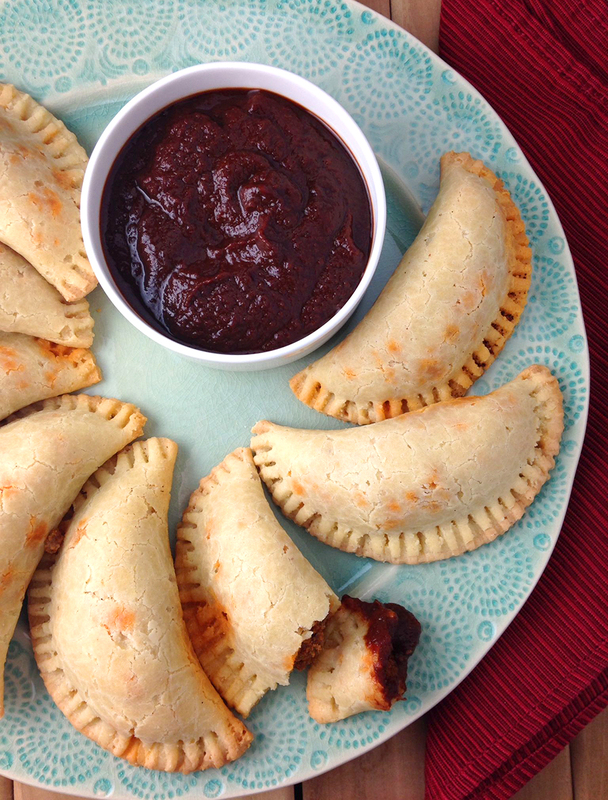 Well, here they are… with a down-home chili spin and a new name to match: “hand pies”. 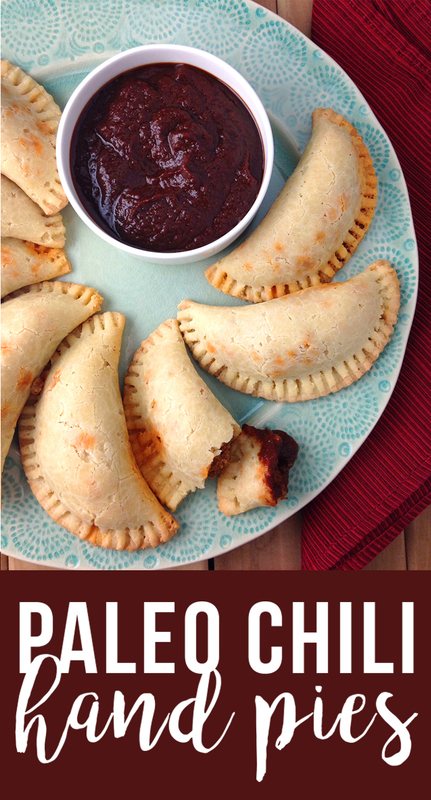 A spicy chili in a thin, grain-free pocket of crust makes these chili hand pies an incredibly fun snack (I love stuff you can eat with your hands), plus a very special thing for a party or potluck. Baking instead of frying cuts down on the effort, mess, smell and greasiness. Thanks to the arrowroot flour, this dough is flexible enough to roll out very thinly and bend without cracking. One note: finely-milled almond flour is required for this recipe. The coarsely-ground stuff sold everywhere in bulk won’t work! 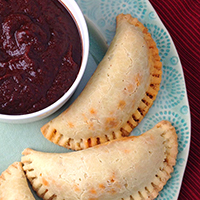 Spicy chili in savory, grain-free pockets of crust makes cute, portable finger-food. To make the chili, coarsely chop the onion and bell pepper, then whirl in a food processor with the garlic cloves until finely shredded. Fry in a large skillet with one tablespoon of coconut oil over medium heat until soft. Add the chili powder, cumin, cinnamon, cayenne, salt and pepper to the vegetables while they cook. Stir in the ground beef and tomato paste, then cook for an additional five minutes. Remove from the heat and add the coconut flour. Mix until crumbly and the meat's grease has been absorbed, then set aside. To make the crust, combine the almond flour, arrowroot flour, and salt together in a large mixing bowl. Add the softened coconut oil. Using a fork or pastry cutter, break it into the flour. Keep working it in until evenly distributed and the flour is crumbly. Create a well in the dry mixture and crack the four eggs in. If your eggs are cold, they'll harden the coconut oil, so be sure and use room temperature eggs. Whisk the eggs together, then slowly incorporate the surrounding dry mix until a ball of dough forms. Knead briefly until smooth, then place in the refrigerator to chill for approximately 5 minutes. Cut the dough in half, working half now and placing the other half in the refrigerator. Lay the dough on top of plastic wrap or parchment paper. Roll out the dough to about ⅛th inch thickness. Using a 4” circle cookie cutter, biscuit cutter or ramekin, cut rounds of pie crust. Place a scant handful of chili in the middle of the dough circles and fold the dough over. Using the tines of a fork, press the edges together, being careful not to rip the dough. Place the hand pies on a parchment-lined cookie sheet. Bake at 350F for 25 minutes or until browned. Let cool enough to touch, then serve. These are best served the day they are made, but will keep in an air-tight container for a day. Do you think these could be prepped and frozen to be baked later? I haven’t tried it, but I don’t see why not. I would do all of the steps until they’re ready to be popped into the oven, then freeze. Can the eggs be replaced with flax and water? Hello Jackie, I’ve never tried that! If you do, be sure and report back. DO YOU KNOW WHAT THE NUTRITION FACT ARE FOR THIS RECIPE? Nope. I don’t track that stuff too closely, actually. Can you sub tapioca flour for arrowroot flour? btw these hand pies look amazing! There’s a good chance you can! Never tried it, though.